Braven quickly made a name for itself in the audio realm thanks to its tough-as-nails Bluetooth speakers. But despite the brand’s impressive audio history thus far, there is one area it hasn’t ventured into: Headphones. That all changed today, as the company unveiled not one but four new models in its brand new Flye Sport wireless headphone line at CES 2017. The titular model is IPX5-rated water resistant and offers around seven hours of continuous playback — decent, but not great for today’s wireless headphones. However, the headphones’ $50 price tag makes up for their mid-level battery run time. The battery pack is located on the cable between the two earpieces, with an aim of lessening the load on the ears for active users. The model is available in Silver/Electric and Slate/Crimson color varieties. If you’re more of a runner, especially one who likes to run in the twilight hours, the Flye Sport Reflect might be a good choice. 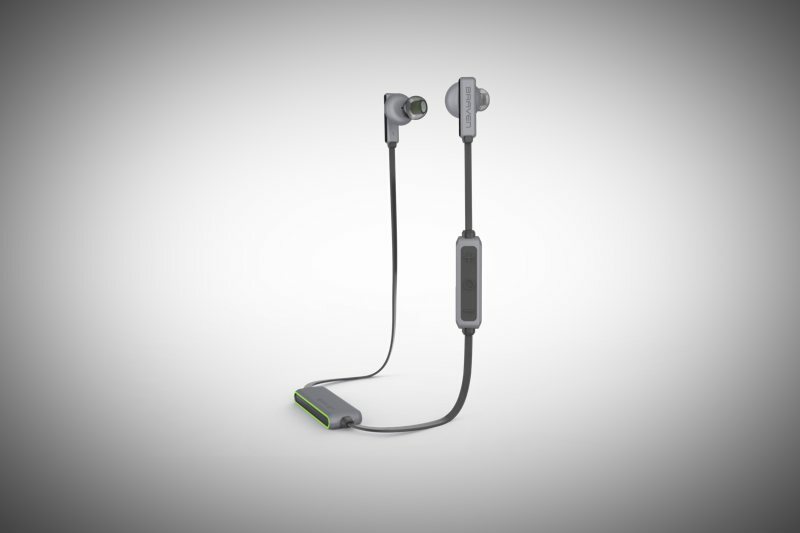 As the name hints, the earbuds are lined with a reflective material to keep you visible at night, and like the standard Flye Sport, these are also IPX5 certified for water resistance. These offer around 5 hours of playback time, though an included external battery pack expands that to 25 hours. This model is available in the same color scheme as the standard Flye Sport and will sell for $100. If you’d rather not have to resort to an external power source to keep the music going, the Flye Sport Power offer up to 10 hours of playback time that can be boosted to 20 hours via a charging neck cradle. This model is also Bluetooth Smart-enabled, and can be controlled via Braven’s Sport Active app, which allows you to adjust EQ, bass boost, as well as Braven’s “Audio Ambient Awareness” feature to let in sound around you for safety. This model is also available in Silver/Electric and Slate/Crimson color varieties, and will be priced at $150. Finally, the Flye Sport Glo offer a true wireless version of the Flye Sport line, with absolutely no strings attached. These also bump up the waterproof rating to IPX7, meaning you don’t need to worry about taking them on a run in the heavy rain — in fact, they’re submersible at up to three feet. These offer 4 hours of playtime on their own, with a 1,400 mAh charging case adding 20 more hours. This model is also available in the same colors as the above models, and will sell for $250. The standard Flye Sport headphone model will be available during the first quarter of 2017, while all the other models are expected to ship in the second quarter of 2017.